This object is possibly the oldest of its kind ever catalogued: the hourglass-shaped remnant named CK Vulpeculae. Originally thought to be a nova, classifying this unusually shaped object correctly has proven challenging over the years. A number of possible explanations for its origins have been considered and discarded. It is now thought to be the result of two stars colliding — although there is still debate about what type of stars they were. 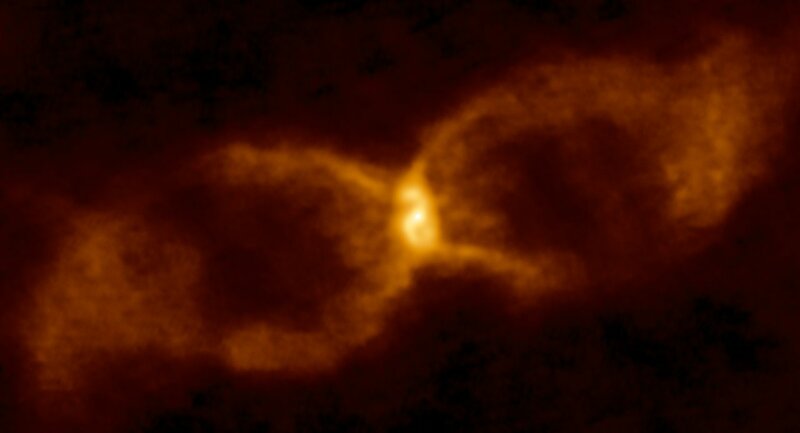 CK Vulpeculae was first spotted on 20 June 1670 by French monk and astronomer Père Dom Anthelme. When it first appeared it was easily visible with the naked eye; over the subsequent two years the flare varied in brightness and disappeared and reappeared twice, before finally vanishing from view for good. During the twentieth century, astronomers came to understand that most novae could be explained by the runaway explosive behaviour and interactions between two close stars in a binary system. 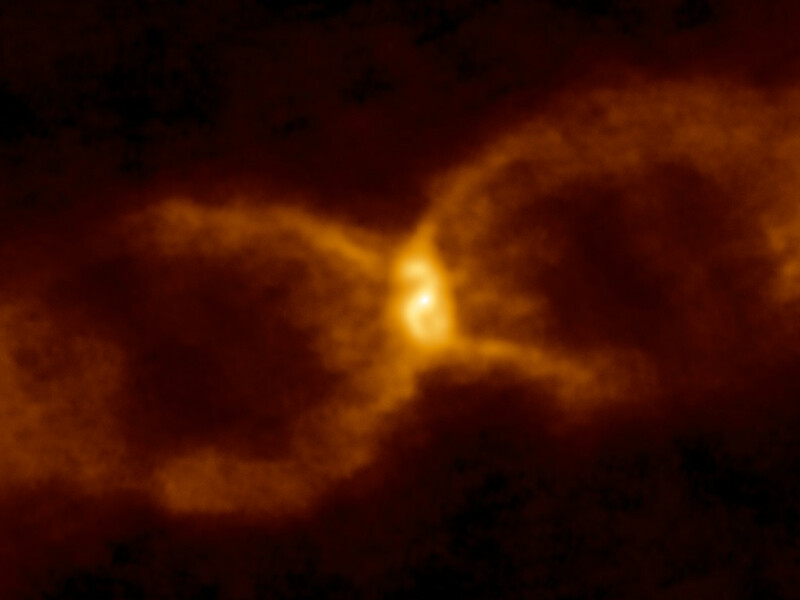 The features seen around CK Vulpeculae didn’t seem to fit this model particularly well,however, puzzling astronomers for many years. The central part of the remnant has now been studied in detail using the Atacama Large Millimeter/submillimeter Array (ALMA). This striking image shows the best view of the object to date, and traces the cosmic dust and emission within and around CK Vulpeculae to reveal its intricate structure. CK Vulpeculae harbours a warped dusty disc at its centre and gaseous jets which indicate some central system propelling material outwards. These new observations are the first to bring this system into focus, suggesting a solution to a 348 year-old mystery. Position (Dec): 27° 18' 45.51"